Your lesson or instructional program will take place at Whistler’s best practice facility, located in the heart of Whistler Village, a short walk from any hotel. Five target greens allow you to work with your instructor on game like full swing sessions. Our short game area allows you to learn about all aspects of the short game including chipping, pitching, bunker play and putting. The Range is now open daily, weather permitting. Pre-season hours are 11:30 AM - 6:30 PM daily. Private lessons, couples lessons and group clinics for beginners and advanced players. Available Mon-Fri after 3:00 pm. Includes green fee, cart, clubs, shoes. Please call 604-938-2750 for more information. Designed for beginner and intermediate golfers alike, this exciting program focuses on the basic fundamentals of golf, including grip, posture, and alignment, basics in swing principles, putting, chipping, and etiquette. Five sessions will have you ready to hit the links with confidence. Have your own group? We'll schedule a time just for you. 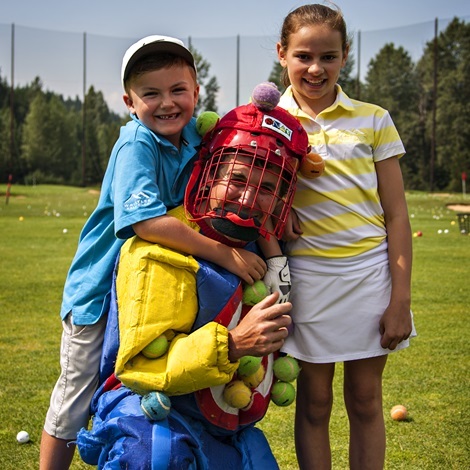 Five 1-hour group clinics taught at The Range and on course at the Whistler Golf Club. Group dinner on the first and last day of the clinic, plus three vouchers to use for a meal and a drink at your convenience during the 2019 season. Includes 4 Green Fees valid after 4:00 PM for the 2019 season. Complimentary rental clubs during lessons. Use of power carts for sunset green fees at $15 per person. Session 2 Mondays May 6, 13, 20, 27, June 3 6:30-7:30pm SOLD OUT! Session 3 Wednesdays May 8, 15, 22, 29, June 5 6:30-7:30pm SOLD OUT! Designed for experienced golfers who are looking to lower their scores through more individual teaching and analysis, these 1.5 hour sessions include extensive video analysis and individual swing correction and game improvement drills. Five 1.5 hour group clinics taught at The Range and on course at the Whistler Golf Club. Session 7 Wednesdays May 8, 15, 22, 29, June 5 6:00- 7:30pm SOLD OUT! Includes 4 Green Fees valid from 4:00 PM for the 2019 season. Session 9 Tuesdays May 7, 14, 21, 28, June 4 5:30- 6:30pm SOLD OUT! Session 10 Tuesdays May 7, 14, 21, 28, June 4 6:30-7:30pm SOLD OUT! Session 11 Wednesdays May 8, 15, 22, 29, June 5 5:30-6:30pm SOLD OUT! Session 12 Thursdays May 9, 16, 23, 30, June 6 5:30-6:30pm SOLD OUT! Session 13 Thursdays May 9, 16, 23, 30, June 6 6:30- 7:30pm SOLD OUT! Session 14 Tuesdays June 18, 25, July 2, 9, 16 5:30-6:30pm SOLD OUT! Session 20 Thursdays June 20, 27, July 4, 11, 18 5:30 - 7:00pm SOLD OUT! We have programs for the your tiny golfer right through to your competitive junior golfer. Led by our C.P.G.A Teaching Professionals, our 4 session Junior Clinics will introduce our students to all aspects of the game including playing safely, pre-shot fundamentals, the swing motion, full swing fundamentals, impact, finishing position, short game skills, equipment evaluation, and practice drills. $89 Maximum 6:1 Student/CPGA Professional Ratio. Our four day half-day schools will include golf instruction for the junior that focuses on fundamentals, safety, etiquette, rules and fun. Our daily activities include instruction at the Whistler Golf Academy, classroom etiquette and rules sessions and more! Each junior will receive a Nike golf shirt and hat. Our Nike Junior 1/2 Day Golf Schools are led by C.P.G.A. Teaching Professionals. PARENTS ASK ABOUT OUR GREEN FEE SPECIAL RATES FOR PARENTS DURING SCHOOL WEEK. Add a set of junior golf clubs and a carry bag - yours to keep - starting at $190+ tax. Club rental for the week is available for $75 + tax. Includes 18 holes of golf daily. Student must have on course experience. Our four day schools will include golf instruction for the junior that focuses on fundamentals, safety, etiquette, rules and fun. Our daily activities include 2 hours of instruction in the morning at the Whistler Golf Academy, on course instruction, classroom etiquette and rules sessions and more! High Performance schools include 18 holes of golf daily. Juniors continue to play the back nine in the afternoon during our High Performance Schools. Each junior will receive a Nike golf shirt and hat along with lunch daily. Our Nike Junior Golf Schools are lead by C.P.G.A. Teaching Professionals. PARENTS ASK ABOUT OUR GREEN FEE SPECIAL RATES FOR PARENTS DURING SCHOOL WEEK. School 8 July 1st - 4th 11:00 am - 5:00 pm Sold Out! School 10 July 15th - 18th 11:00 am - 5:00 pm SOLD OUT! Two day weekend school to get your summer started right! Includes on- and off-course instruction and lunch. Designed for our tiny golfers ages 4-6, our 1.5 hour, three day morning schools focus on fundamentals and fun using the Snag Golf system. Duncan Savage, Director of Instruction. C.P.G.A. Class A Professional. Duncan Savage joined the Canadian PGA in 2001 after relocating from Southern Ontario to Whistler, British Columbia. Duncan has travelled many of the worlds top golf destinations and taught in both the United Kingdom and Australia.15 years of teaching every age group, skill set and group size has helped build a very experienced well rounded teaching style. Duncan's teaching philosophy allows the student to stay within their physical capabilities while challenging them to reach the next level. "A simple explanation of what I want the student to achieve and why it is important, paired with effective drills and video analysis is often the key to lower scores and greater enjoyment of the game." Duncan grew up learning to play golf from the age of 6, his entire family played competitive golf from a young age and regularly travelled the world with golf clubs in tow. His continued passion for the golf swing and entire game can be felt through a single lesson or a long term coaching program. Wade Sutton C.P.G.A. Class A Professional. Wade Sutton a native of Montreal moved to Whistler in 1991. Wade has been golfing for 31 years and turned pro in 1994 and became a Class A CPGA (Canadian professional golfers Association ) in 1999 after completing his five-year apprenticeship. Wade is a full-time not just in the golf industry but the ski industry. Wade works at Whistler Blackcomb as a CSIA (Canadian Ski Instructors' Alliance) Level 4 Ski Professional where Wade has worked for the last 23 years. He also works for the CSIA as a senior examiner of all 4 certification levels. Wade is on the National Board of Directors of the CSIA showing how committed to the education of technique of not just skiing but all sport.